Throughout Egypt, domestic structures are traditionally constructed of brick, stone or adobe, typically between two and five stories in height with projecting oriel windows. Referred to as Mashrabiya, the street-facing bay windows are commonly enclosed in an ornamental screen of wooden latticework. The primary function of a Mashrabiya screen is privacy—the dense crisscrossed pattern preventing any vantage point from the exterior. 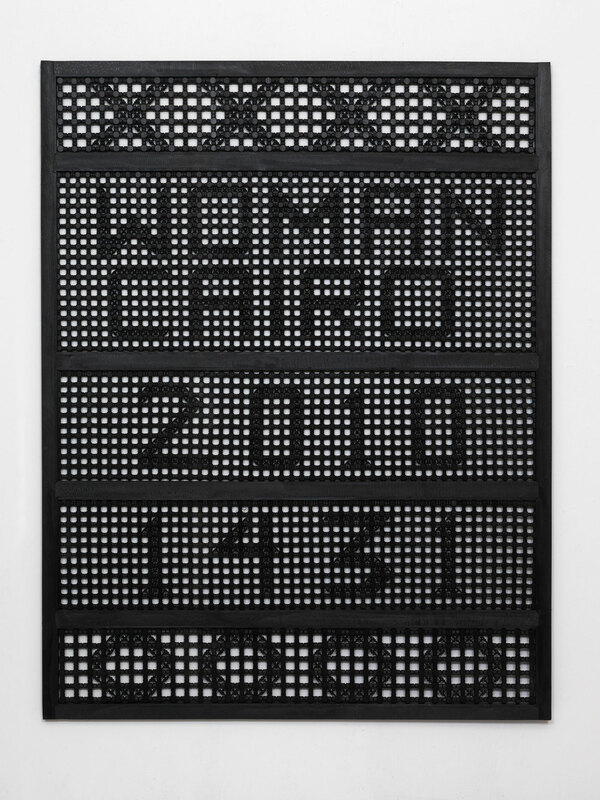 A number of displaced Mashrabiya screens can be found in Susan Hefuna’s current exhibition, meticulously assembled by the German-Egyptian artist and painted with black ink. However, the latticework of Hefuna’s Mashrabiya screens is not merely ornamental, as messages such as “WOMAN CAIRO” and “CONFESSION” appear within the wooden pattern as the viewer recedes from the structures. Legible only when viewed from a distance, the words position their reader just outside of the private space the Mashrabiya would presumably enclose.